Thanks to its world famous wine - Jerez or "Sherry", the name given to this Andalucia city long ago has extended its borders to everybody becoming universally renowned. The distinctive wine in Jerez has been exported for centuries, and was introduced into britain in Elizabethan times. It is distinctive because the strong sun gives the grapes a high sugar content. British wine importers with famous names such as... Humpbert & Lambert makers of Dry Sack and Dry Fly, Harvey's, famous for its Bristol Cream Gonzalez Byass, produce among other brands Tio Pepe, Pedro Domecq and Sandeman, they are merchants who have been involved in the wine trade here for centuries, producing and shipping sherry the fortified wine. Although the very large wine industry. 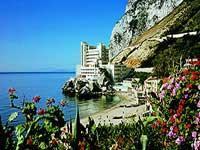 had a major influence on the city it has recently grown rapidly, with tourism. With the council's aim on promoting Jerez and its pledge to restore the many historical sites, is it easy to see the changes over the past couple of years. Most of the many wine lodges (bodegas) that filled the cobbled streets of most of the city center have now moved into prestigious new premises, just outside of Jerez. Visitors are welcomed at the lodges and tours can be made in the mornings. The horse plays a major part in Jerez, with the World Horse Championships held and at the beginning of May each year. There is also the famous Horse Fair celebrations in the street and people heading to one of the most spectacular fairgrounds in Spain. To see the carriages drawn by teams of horses and the costumes of the ladies in their flamenco dresses accompanied by smartly dressed men riding their horse, is a sight not to be missed. incorporation of Renaissance and Baroque architectural elements. If the Jerez churches surprise us by their number and their wealth, the list of Renaissance, baroque and neoclassic palaces erected by the aristocracy, agriculturist and the vintner is even more impressive. One of its largest wine lodges is that of Gonzalez Byass set in beautiful gardens and stands next to the beautiful imposing Cathedral. 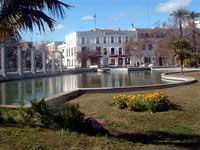 The modern Jerez has moved with the times, its wide avenues and parks give a spacious feel. Large commercial centres are to be found on the outskirts of the city. A visit to the Zoological and Botanical Park of Jerez is worthwhile. It makes for a relaxing day can be spent among the animals and flowers. Another popular attraction is to visit the equestrian display of the famous dancing horses which takes place every Thursday in the morning. All the bodegas arrange tours in the morning of these are very interesting and full of surprises for visitors. The Jerez City council's constant objective is to make available to all visitors their latest webpage with a new version of the street guide of the city. It is more updated, in better quality of information and photos of the city.